USB-like ENDS: A new type of ENDS that resembles a USB has become popular among youth and teens. 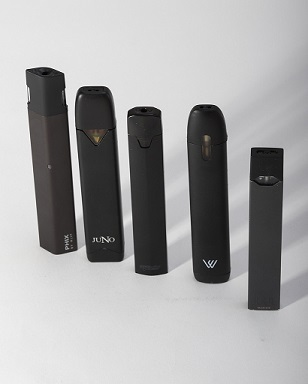 JUUL was first company to develop USB-like ENDS, and other products, such as the MarkTen Elite and Pax Era, have followed7. The act of using a USB-like ENDS is sometimes referred to as JUULing7.These devices come in a variety of flavors and are easy to disguise or hide.8 Prior research on nicotine product use among adolescents suggests that ENDS usage in general could be potentially dangerous and addictive for the developing brains of youth and teenagers and can encourage adolescents to abuse nicotine9. Amiri, A., & Vazquez, K. (2017). Electronic Nicotine Delivery Systems: Are You Prepared to Have a Conversation With Your Patients?. Alabama Nurse, 44(1), 14-16. U.S. Department of Health and Human Services. E-Cigarette Use Among Youth and Young Adults: A Report of the Surgeon General-Executive Summary. Atlanta, GA: U.S. Department of Health and Human Services, Centers for Disease Control and Prevention, National Center for Chronic Disease Prevention and Health Promotion, Office on Smoking and Health, 2016. Barrington-Trimis, J. & Leventhal, A. (2018, August 22). Adolescents’ Use of “Pod Mod” E-Cigarettes – Urgent Concerns. The New England Journal of Medicine. 379, 1099 – 1102. DOI: 10.1056/NEJMp1805758.